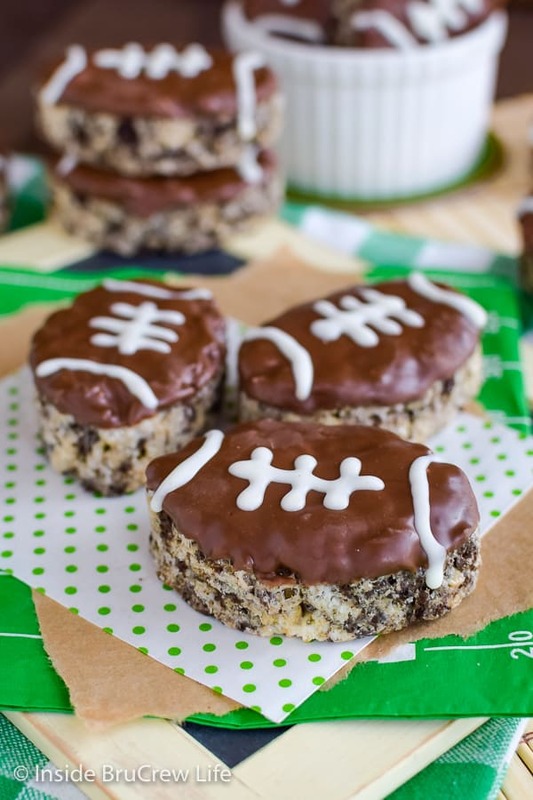 Game days are more fun with these easy Football Rice Krispie Treats. 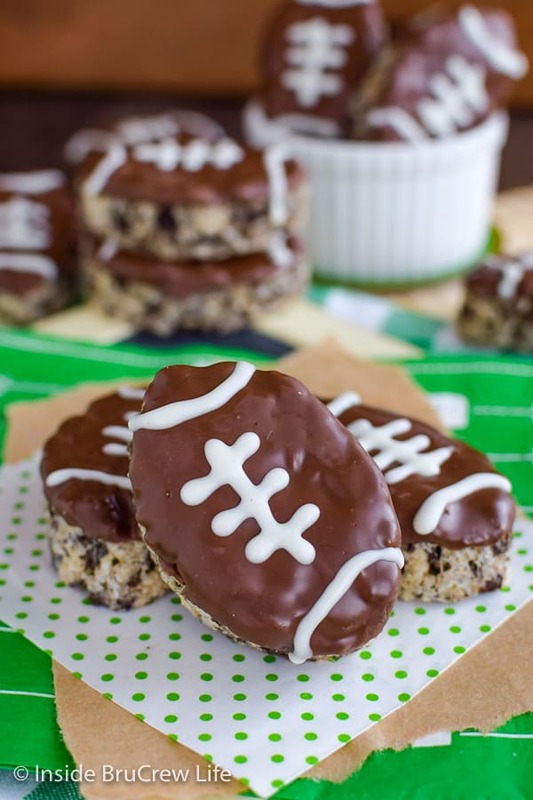 Mint cookies and mint chocolate make this game day dessert a winner with everyone. I hear there is this big game this coming weekend. I think it’s the game where they ride horses around and hit a ball with a stick. Ha ha I’m just kidding!! Super Bowl Sunday is this weekend and that means hours and hours of football. My mind is going numb just thinking about it. Don’t get me wrong! I love a good game, but I’m just not so much into watching sports, as I am in playing them. Seriously, I’m there just for all the food. Just lead me to a table loaded down with Chicken Fajita Queso Dip, Stuffed Crust Pepperoni Pizza Bites, and White Chicken Chili and I will be happy for hours. Well, until the food runs out. I better make extra, so that doesn’t happen. This week I have quite a few projects that I have to finish and have done. So, what do I decide to do? I decided to make a football dessert instead, of course! Was this one of the projects that NEEDED to be done? Heck no! But when I get an idea in my head, I just can’t rest until I see it through. I wish I had that kind of attitude when it came to cleaning my house. Sadly, since I have started working full time, the cleaning has slacked off quite a bit. Thank goodness for older children who can help out on the weekends, right? Anyway, I realized that after years and years of blogging, I only have two football treats on this blog, and one of them isn’t even a sweet treat. 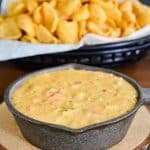 I made football chips to go with this Guacamole Hummus 5 years ago! And these Football Cookie Bars two years ago. Only two football treats? What in the world have I been doing every February? Apparently, I was more concerned with Valentine’s treats and making sure you had Red Velvet Cheesecake Brownies and Red Hot Oreo Fudge. Both of which, you should totally try by the way. The other night I decided right then and there that a cute football treat just had to happen. Forget the projects and dead lines! Well, forget them for one more night anyway. I dug through the baking cupboard and emerged with mint Oreo cookies, Andes mint chips, marshmallows, and Rice Krispie cereal. The lightbulb went off immediately! It has been way too long since the last Krispie treat, so Mint Cookies and Cream Rice Krispie Treats it is!!! Anyway, he said these were the best ever Rice Krispie treats. I caught him in the dining room sneaking a few extra ones in the dark because he liked them so much. Score!!! 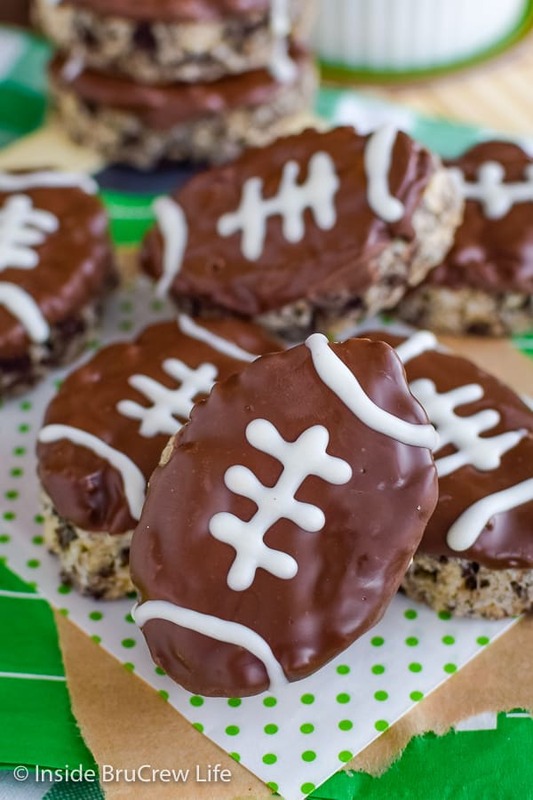 This sweet football is the perfect Rice Krispie treat for game day parties! Be sure to check out my Easy Football Party Ideas too. Heat the butter and marshmallows in a large pan over medium heat until melted and creamy. Stir in the cereal and mix it all together. Add cookie crumbs to the mixture and stir them in gently. Press the mixture into a buttered 8×8 pan and let it cool completely. Use a football cookie cutter to cut out 12 footballs. You may need to press together the scraps to get the last one. 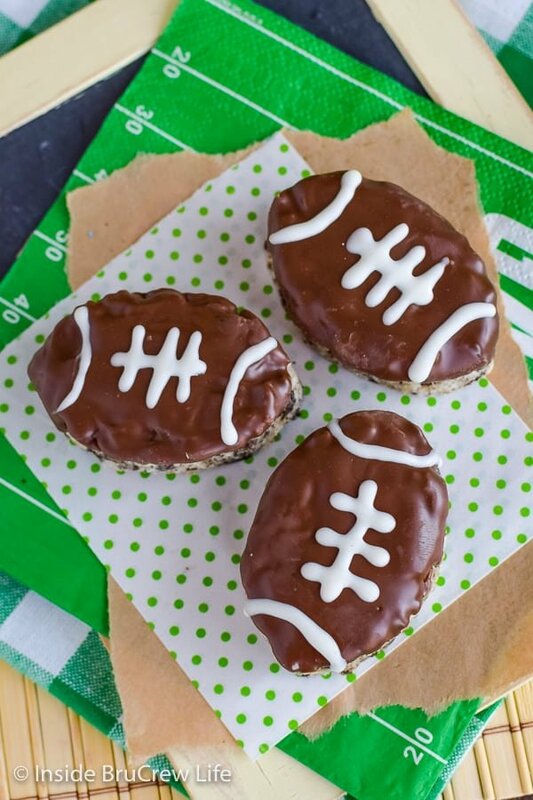 Melt chocolate in the microwave and dip the tops of the football treats in it. Add drizzles of melted white chocolate to the tops for laces. Let set before placing in a container. Why are my Rice Krispie Treats so hard? Make sure you are using fresh marshmallows. And be sure to heat your butter and marshmallows on low heat. It may take a few minutes longer, but it is worth it. Also, do not press the mixture into the pan really hard. You want it to stick together, but not be so packed that it ends up rock hard. How long do Rice Krispie Treats last? Well, it totally depends on who is in your household. They don’t last more than a day in our house. If you place them in a tightly sealed container, they are good for a few days. Can I freeze Rice Krispie Treats? Yes, you can place them in a freezer safe bag separated with pieces of wax paper. Remove all the air. They should be good for six weeks. Let stand at room temperature for at least 15 minutes before serving them. 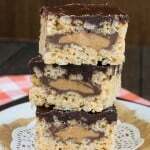 These Peanut Butter Cup Rice Krispie Treats are one of the most popular recipes on here. A layer of Reese’s and chocolate on top makes them disappear in a hurry every single time. Adding cookies and candies makes these Monster Cookie Rice Krispie Treats a fun no bake treat. 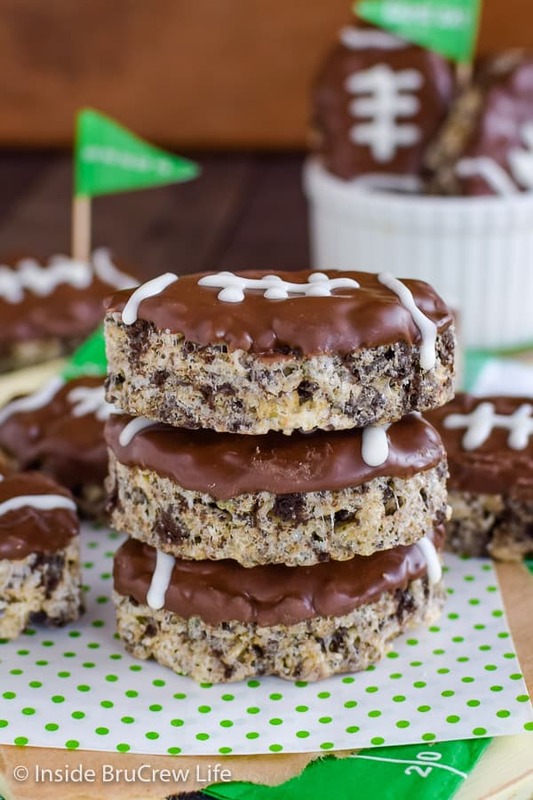 Perfect for bake sales, school auctions, or game day parties. 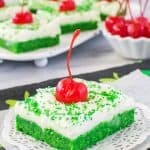 All the chocolate and mint goodness in these Brownie Mint Rice Krispie Treats will make them a new favorite dessert with everyone you share them with. Caramel and chocolate make these 100 Grand Rice Krispie Treats taste like the candy bars. They are so chewy and delicious! 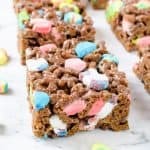 Enjoy a copycat Rocky Mountain Chocolate Factory treat with these Avalanche Krispie Bars from Shugary Sweets. Butter an 8x8 pan. Set aside. Place the butter and marshmallows in a large saucepan. Heat over low heat until melted. Stir in the cereal until completely mixed. Add the cookie crumbs and stir in. Press into the prepared pan. Let cool completely. Place the Andes mint chips and 1 teaspoon shortening in a microwave safe bowl. Heat for 30 seconds. Stir and heat again for 15-20 second. Stir until melted. Dip the tops of each football in the melted chocolate. Let set. Place the white chips and 1/2 teaspoon shortening in another bowl. Heat for 30 seconds. Stir and heat again for 15-20 seconds. Stir until melted. Let cool slightly. Spoon into a small plastic bag and cut a small tip off. Pipe laces onto each football. Let set. Store in a sealed container on the counter. 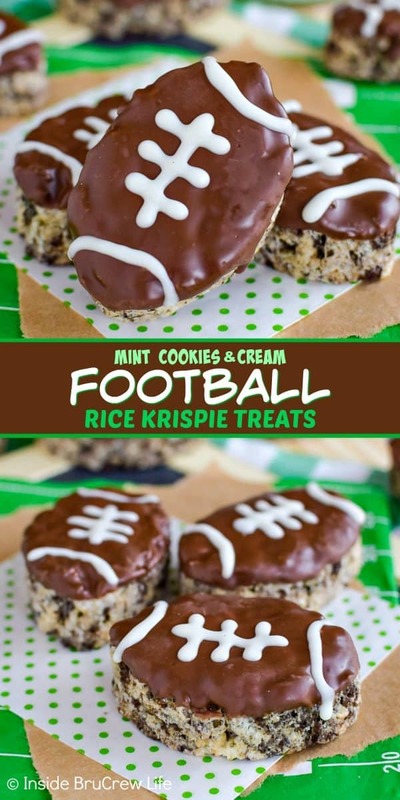 *The recipe and post for these Mint Cookies and Cream Football Rice Krispie Treats was originally published on January 28, 2015. The pictures have been updated and it has been republished on January 30, 2019. These are just too cute for words. On those adorable football napkins, too! I can barely stand it. And props to your son for eating them on the sly! I guess he had to, since apparently they were popular enough to disappear overnight! I love when treats come together from stuff in my cupboards! These are so cute! Oh so cute Jocelyn! I love your creativity. Fun. fun.fun. These are adorable, Jocelyn! But everything you create is adorable. So fun for game day too! I’d come to even a football related event if these were on the menu. Cute and fun! 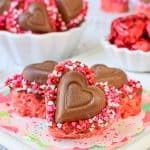 My little baking daughters would love to help make these…they love any excuse to bake treats! Thank you so much Kristen. These are the perfect little treat for little baking buddies to help with!! For us it’s hours of tiptoeing and whispers because Dad needs to watch the game. I can’t wait until MONDAY. 🙂 LOVE these so much – they’d make Jordan want football. She’s obsessed with mint. Woo hoo! Monday is almost here 😉 And yes, Jordan would die for these. They were so good!!! Another batch is happening here today!!! Seriously so cute and delicious, no doubt! I agree with you 100%!!! Bring on that food table!!! Those are adorable. Oreos have got to be one of the best additions to the Rice Krispie treats! 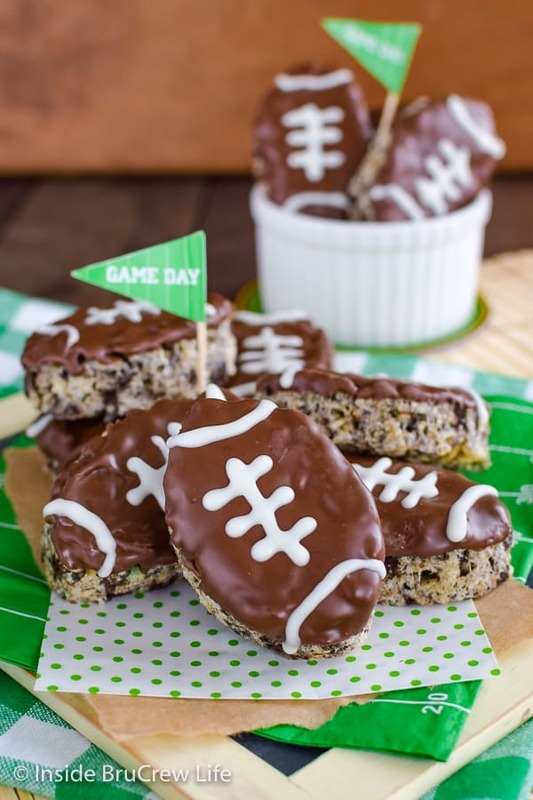 I’m glad you decided to make another football treat because these are so cute! And I’m a big fan of rice krispies and mint oreos – yum! 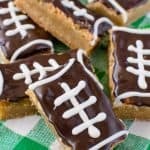 These are the perfect treat for Super Bowl Sunday, but would be great for a sports-themed birthday party too! Oh, my word…you are so right!!! I was so focused on having a cute game day treat that I totally forgot about sports themed birthdays and baby showers!!! You are a genius 🙂 Thanks for opening my eyes!!! I never thought to even make cookies and cream krispie treats myself, let alone mini cookies and cream! I am, however, completely salivating over the keyboard at the thought. They’re too cute too, loving the mint chocolate chip topping too. These are so adorable, Jocelyn! Such a perfect treat to make for Super Bowl Sunday and for my rice krispie loving husband. Love the mint flavor, too! Pinned! Thank you so much for sharing Gayle!!! These are beyond cute. Oh my goodness, those Oreos and then the icing job … you nailed these. The food table is where you’ll find me too, and believe me, these would be the first on the plate! Awe thanks so much girl!!! These were too fun to make!! And yup, I’ll be right beside you at the food table loading up my plate! You seriously just made my day!!! Thank you for the sweet comment! 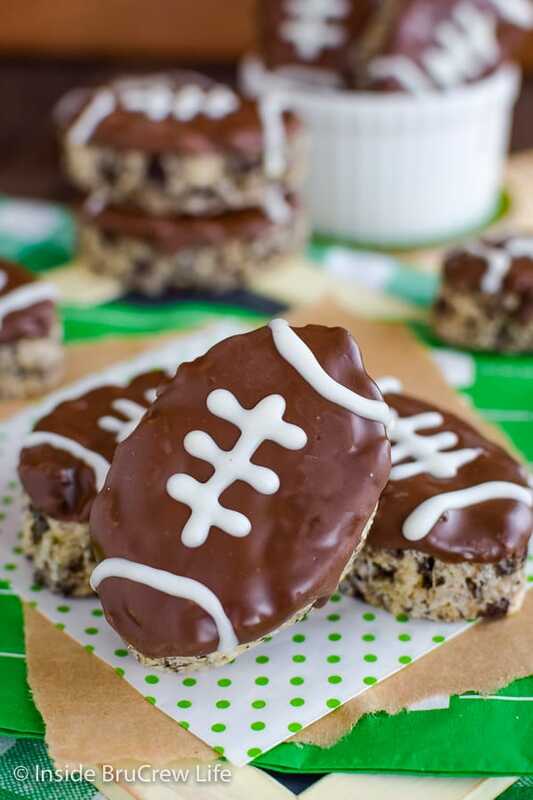 These are adorable football treats and I do love rice krispie treats. They do bring back happy memories. These are just too adorable! What a fun treat!! Can I borrow one of your kids Jocelyn?? I’m embarrassed to say how often I clean. And vacuum. There are just too many recipes to be tested and photographed! 😉 These RKT are WAY too cute! I bet they’d be the first thing to go at the food table this weekend. Pinned! Hahaha! I will trade you some kid cleaning time as long as you share your amazing healthy treats with me!!! Deal? So fun for the Super Bowl! I love the added Oreos and mint….OMG! These are adorable. And so easy to make. Oh and did I mention they taste amazing??? What a fun way to add a little whimsy to our super bowl party! !